When the dead decide to have a drink with the living, it quickly turns to revealing personal truths in song. 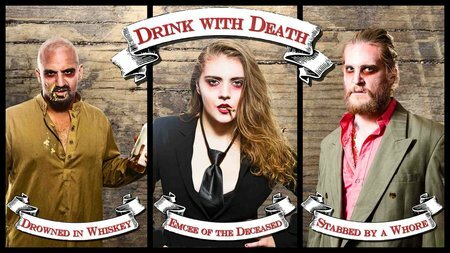 Or at least it does in Drink with Death: a morbid cabaret, presented by Romana Soutus and Christopher Weatherstone. And what songs they are. An incredibly dedicated cast, each exceptionally talented musicians in their own right, take turns belting out their stories. Even at their worst, these are not pieces to be taken lightly. The songs are carefully crafted and lovingly performed, the musical styles adding another dimension to conventional tales of human woe. Drink with Death made me sit back, relax, and just let the various musical and vocal feats take everything away. It is hard to pick just one aspect of the music to talk about, but I loved the two vocal powerhouses that existed in Ada Dahli and Sarah Jane Scouten. Their vocal harmonies and individual songs were haunting, relying on a combination of raw vocals, commanding presence, and an acidic humour. Neither Dahli nor Scouten could entirely disappear into the chorus, and my ear always sought them out. Overall, my personal frustration with Drink with Death was that it was structurally weak. The real question is whether this criticism is entirely valid. There is no attempt for the cabaret to hide its true purpose–a collection of musical performances—in any coherent narrative. The premise is the audience sharing space with the dead, and hearing their stories through song. And that is exactly what the show delivers. At the same time, the little narrative pieces we are given, the performers exchanging barbed commentary with each other during pre-show and during intermission, hint at a bitter undercurrent of dislike. It would have been interesting to inject a central moment to develop the underworld atmosphere, and ultimately ground the banter. It’s too bad that Drink with Death‘s weakness is the same thing that makes the music so much fun. Specifically, the stories and their avatars are, for the most part, uninspired stereotypes. The selection of characters ranges from beaten-to-death gambler to sinning preacher to dead philanderer with very little in the way of development. While the cast embraces their performances to a point that it feels bad to criticize, it is still hard for me to ignore that they are still little more than a collection of tropes. The fact that one of the more compelling performances emerges from the result of a starlight tour suggests that the cabaret could definitely benefit from shedding conventional tropes for more relevant material. I want to take a moment to say, however, that Michael Louis Johnson’s powerful performance was a favourite of my guest. She felt it was the most powerful image of the evening: Johnson shuffling down the center aisle, singing. As an entertaining evening, Drink with Death definitely brought a smile to my face. The cast never broke their characters, going so far as to sit and converse with the audience, much to everyone’s amusement. While I should warn people that the work is centered on the music—don’t expect any surprises here—I think that the show’s charm stems from the rough edges in character and plot. As an audience, we are invited to enjoy the moment with all its imperfections, and both my guest and I were swept away until the end. Drink with Death is exactly what it says on the tin. The audience is invited to hear the stories of long-dead people over shared drinks. It is an evening of reminiscing, reminding, and listening to a past that can never quite stay dead.